Earlier this year in May at the end of a 3 year Shamanic training I was saying Good bye to a favourite yew hedge that I had spent time with throughout my training and as I entered the Yew and stood under a Yew arch way I noticed a blackbird sitting in the hedge. Blackbird is one of my faithful guides and I was humbled to be in such close proximity with the bird. I stopped in my tracks and found myself eye to eye with the blackbird. The moment that we spent together eyes locked in deep understanding was timeless and one I will never forget. So special, so beyond words so deeply speaking to that knowing and interconnectedness of the universe. You might think “Oh well it was just a blackbird”, but for me I was connecting with the divinity, infinite power and deep knowing of the universe that we all know to be true. I posted a popular Yew Tree clip in the Plant Spirit People FB group the other week, to help you experience the energy of my favourite local trees if you missed it see it here. If you’d like to journey deeper with the healing medicine of the Yew, check out my Nature Speaks Healing series which is a transmission recorded in an ancient and magical grove of Yew trees close to my home. 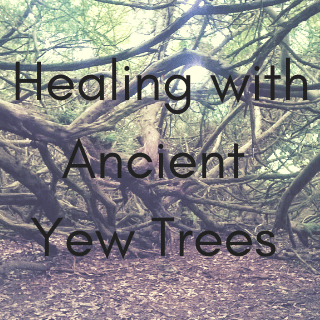 If you’d like to journey deeper with the healing medicine of the Yew, check out my Healing with Ancient Yew as part of Nature Speaks series. 20 minute video discussing the Yew’s mythology and use. Pdf worksheet for deeper personal insight and meaning. Meditation package is 29.99 USD/22 GBP. Get yours below.